13,0000 gallons spilled by Shell on Sunday. In the Gulf of Mexico, spills remain an all too common occurence. On Sunday December 18, 2011 there has been a reported release of 13,000 gallons of oil and drilling fluids into the waters of the Gulf of Mexico, some mere 20 miles from the site of the BP / Deepwater Horizon oil spill. 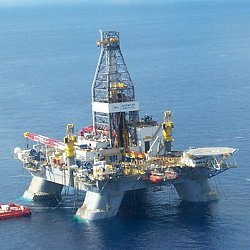 Once again the drill rig is a Transocean Deepwater series rig, similar to the Deepwater Horizon drilling platform that was lost following loss of control of the wellhead. While the driller, Transocean, is the same, the company they work for is different. In this case it isn’t BP, but rather Shell Oil, a company who extolled its safety programs and harshly criticized BP’s plans in the waves of criticism and finger pointing following the disaster at the Macondo well which spilled millions of gallons of oil and resulted in the loss of human lives. Shell, which has been promoting its ability to operate safely, is the same company who is getting incrementally closer to achieving all the required permits for it to drill in the Arctic under conditions that some are too hazardous for any company to risk, given the sensitivity of the arctic environment and the questionable ability to address accidents including oil spills which could result from the drilling activity. The fact that spill free drilling operations are not, in any real world conditions, possible continues to prove itself. 12/20/11 UPDATE: Shell reports that the fluid loss was synthetic drilling fluids, which they say are biodegradable. The fact that accidents, even in areas near the BP Macondo well spill which have heightened scrutiny, continue to occur, and the releases of materials are not gallons but tens of thousands of gallons, remains alarming.